With the UH football season barely five months away, two of the Warriors' opponents have yet to be determined. With the 2007 football schedule incomplete, UH's AD admits getting "greedy"
Hawaii athletic director Herman Frazier said he "miscalculated" while working on the 2007 UH football schedule and that he should have booked a complete 13-game slate earlier in the process. Frazier also said he believes his credibility and effectiveness as an athletic director remain intact despite missing self-imposed deadlines for announcement of schedule developments and the accompanying media and public criticism (see sidebar). He also said he remains optimistic about booking another BCS conference opponent for the upcoming season, and "we will open with a home game on Sept. 1." He said he expects the schedule will be 13 games. The Warriors have a pair of openings for the coming season, but some work has been done on later schedules. The vast majority of teams around the country have completed their schedules. UH has announced 11 games (three of them nonconference), not including a Sept. 1 home opener. Frazier said he has "talked to" Northern Colorado, a Division I-AA team that has emerged as a possible opponent for the opener. It would be the second I-AA team on the slate and severely hurt the Warriors' strength of schedule in a year in which they have enough talent to contend for national rankings and, possibly, a lucrative bowl game. Warriors coach June Jones has declined public comment on the issue. Frazier spoke about schedule issues and his standing among UH fans and other stakeholders during an interview with the Star-Bulletin on Friday. "I think what people need to understand is we're not making any excuses in not getting (the schedule) done in a timely manner," Frazier said. "There have been mitigating factors all the way through the process. As we kept trying to close a deal, other things would happen that opened it up." Frazier said he has worked with "24 different scenarios" regarding the schedule, going back to last fall. Scheduling difficulties were compounded by Michigan State pulling out of a 2007 game at UH, and NCAA legislation that allowed teams to play one more game than before. For most schools, the limit went from 11 to 12 (teams playing a game at Hawaii, including the Warriors, can now play 13 instead of 12). In fact, Michigan State cited the 13th-game issue as a reason for pulling out. MSU paid UH a $250,000 inconvenience fee. The result was Frazier found himself with four 2007 openings late last year. He said then and now he could have filled them at the time, but chose not to in order to try for the most attractive lineup possible. At one point, he had hoped to book a schedule of eight home games. If there were to be a sixth road game (one was already booked at UNLV, and the Western Athletic Conference accounts for four others), it would be against a big-time opponent for a big payday, the opportunity to showcase quarterback Colt Brennan as a Heisman Trophy candidate, and give the Warriors a shot at a huge win on the road. He now acknowledges that ambition as a mistake. "We may have gotten a little bit greedy," Frazier said. "I miscalculated, because at the end of the day, too many people were involved in it, because somebody wanted to do this, and somebody wanted to do that," Frazier said, citing the involvement of ESPN as a matchmaker in situations involving up to four teams at a time. "When we were talking about six home games vs. eight home games, I should've just knuckled down and done it myself." Frazier said he could have booked a 2007 schedule late last year that would have included Texas A&M and either North Carolina State or Texas Tech, all on the road. Louisville on the road was also an option. But he wanted to hold out for more home games. "In November we could've done it. Do I regret it? Now, yeah. I need a game," Frazier said Friday. Frazier said what looked like a golden opportunity emerged when ESPN tried to broker a game at Michigan on Sept. 1. Frazier would've preferred playing at USC, which was also being considered. But the Trojans were already matched with Idaho, and ESPN wanted the Hawaii at Michigan game, Frazier said. "We called Michigan, said you take Idaho and we take USC," Frazier said. 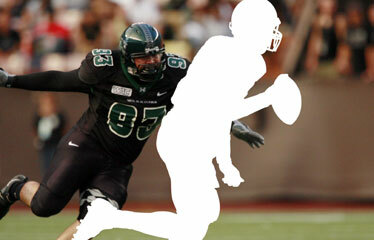 "I wanted to take Colt Brennan (who is from Southern California) home to start his senior season. They said OK. Meanwhile, ESPN pushed us at Michigan to open the season. They said that would be better exposure. That took a lot of discussion. My first e-mail about Michigan is Jan. 25." Attempts to schedule Michigan or USC went to "early March," Frazier said, and were finally nixed when Michigan coach Lloyd Carr balked at playing UH. "It would have given us great exposure. But at the end of the day, if none of what ESPN tries works we get left holding the bag. ESPN was trying to help. But they're going to do what's good for ESPN and I have to do what's right for the University of Hawaii." Washington -- which nearly contracted to play UH at the end of last season -- agreed to a Dec. 1 game at Aloha Stadium. But it filled just one of four openings. Hawaii's always-problematic scheduling situation has become more so, Frazier has learned. "The fact is it's not as easy to get teams at home. It is a well-known fact that our team is very, very competent. What people considered a win no longer exists," he said. "There are many schools that will not play 13 games, dependent on the calendar year they may not have a bye. "The days of eight home games are probably gone," he said. Another opportunity arose in early March, to host Wyoming, Frazier said. It required some fancy footwork that included replacing the Cowboys at LSU in 2009 or 2010 (and receiving a $650,000 guarantee), which Frazier was willing to do. He said he mailed out contracts, but the Mountain West schedule nixed Wyoming's end. Frazier continues to say he has hopes for another 2007 opponent from a BCS conference, an announcement that has been on hold since March 12. The previous week, at the Western Athletic Conference basketball tournament, Frazier said the schedule, which had three openings remaining, would be announced the next Monday. But all UH fans got was confirmation that Charleston Southern, a Division I-AA team, would visit UH. One unsatisfying booking, two openings remaining. "I will explain March 12 when I can," Frazier said Friday. When asked if the remaining BCS conference team would be a road game, Frazier answered yes. "It looks pretty good. We've got options," he said. "We're still waiting for this other thing to take hold. It has to do with something more serious than anything having to do with a football schedule. It's not even about sports. It's about an individual's life." Frazier was asked if he was referring to Indiana coach Terry Hoeppner, who has undergone brain surgery twice in the past 15 months and is skipping spring practice. Frazier indicated he wasn't talking about Hoeppner. There was speculation in recent weeks that UH was trying to book a game at Indiana, but Hoosiers officials said their schedule is set. Because of the Hawaii exemption that allows the extra game, it is possible a team could add the Warriors at this late date. But it would have to be at Hawaii or likely take major juggling. "You won't find it by looking at the schedules (openings)," Frazier said of the mystery school. "Don't waste your time." Frazier said he plans to complete schedules for future years far ahead of time and be done with them. He said he had a discussion with BYU athletic director Tom Holmoe on Friday about resuming the series with the rival Cougars, which has been dormant since 2002. Frazier had an opportunity to start a series with BYU last season (with a road game), but declined in order to play Oregon State at home. "As soon as this fiasco is over, we're gonna get future years done and get us out of the market. We have teams knocking on the door for '08 and beyond," Frazier said, but added. "They ain't jumping at us (for 2007), though." Still, he said he remains optimistic for a full 13-game schedule in 2007. "We never said it would be a 12-game schedule," Frazier said. "We've got options." Hawaii athletic director Herman Frazier has addressed the subject of football scheduling numerous times in the Star-Bulletin. Here are some of his direct quotes. "We should have been making some kind of decent money when we played at UNLV or USC. To go on the road, I want money. The stature of our program deserves money, and none of this we go on the road to go on the road." "We haven't finalized Michigan State. It's still under discussion. Depending on Michigan State, I don't know which way that might go." "It will fall into place." "If I'm going to do that (play at Louisville), I might as well play at Georgia." "Perhaps another team on the road. But it all depends on who the anchor is. And my anchor depends on what happens with the Michigan State part." "To have a schedule is not the issue. What I'm trying to do is go after a certain mix. Otherwise I could have the games. We hold out until we get the best deal going. That's how we do it. I'm going to do what's best for us. Now, at the end of the day, I'm gonna fill it all up, one way or the other. But that's not a problem, because I know just what's out there. I can go get a schedule tomorrow, but it's not the optimum schedule." "Obviously for me to be holding out this long, it has to be BCS conference schools. The reason we've held out on our schedule is because we can get better teams and there are more people assisting us, like ESPN, the WAC and the other conferences." "If I had all the dates filled, the flexibility goes away because we can't change (the opponent). But we're talking about mostly home games." "ESPN, in conjunction with the WAC, will release (a schedule) in either the first or second week of February. It will include all of our conference games. We will (release the nonconference schedule) at the same time or earlier." "Now that we know the WAC dates, we'll finalize our nonconference matchups and be prepared to release them Monday afternoon. I realize that fans have been anxious for the schedule to be released. However, due to many factors, this has been a difficult process and I've been working diligently to put together a nonconference schedule that is in the best interest of our football team and our fans." "I ain't guaranteeing anything, based on how people react." "I can't go into complete detail about that." (when asked if UH was negotiating with a Division I-AA school). "Once we slot that, we will announce the other game. We know what team we're talking to, but it's more than just that." "It's amazing, isn't it, in the middle of all of this? As long as they know when the home games are, there's no issue."